Black Widow's inclusion in this "Ultimate Legends" series could not be more of an afterthought. You can absolutely tell that this idea started with someone pitching the idea of a Ghost Rider with his motorcycle, then admitting that selling one figure in its own pricepoint and branding makes no sense. 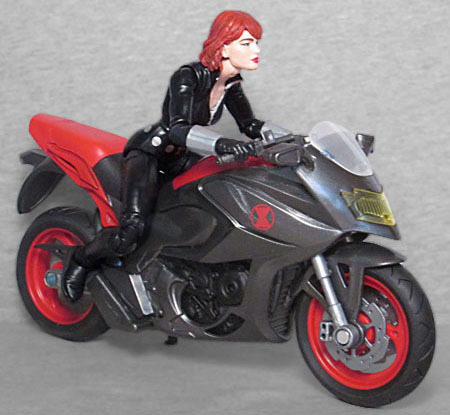 So they began casting about for someone who could conceivably also be sold with a bike, and, swiftly realizing that Marvel Legends wasn't quite to the "let's sell a toy of Turner D. Century" level yet, they had to dig down into the stable to come up with "wait, Black Widow rode a motorcycle in one of the movies, didn't she? Let's just do her." Because it's not like there are any other characters known for being bikers, right? Natasha, surprisingly, gets a new sculpt. 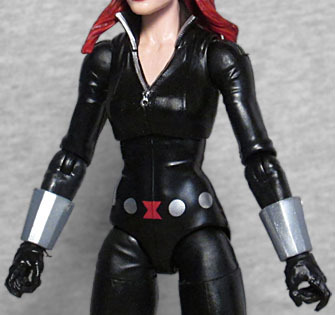 Even the Retro Collection Black Widow stuck with the medium female body, but this one has a new, unique mold. It's not substantially different from the existing bodies, but it has sculpted seams going down the outside of the legs, and tiny wrinkles everywhere to make it clear that she's wearing a full-body spy suit, not just skin painted black. She has her collar unzipped slightly, revealing the pink skin of her neck. This suit clearly represents her original costume, because it has silver bracelets and belt, instead of gold (though the two tend to swing back and forth pretty regularly, anyway). The bracelets are rough and blocky, and honestly look unfinished, like someone handed in the digital file before they replaced the placeholder sculpt with the final one. Her belt, meanwhile is only accomplished via paint - the red hourglass buckle and the silver discs alike. Guess Hasbro's planning to reuse this body. 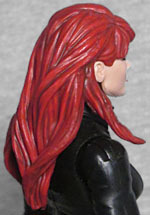 Widow comes with two heads; or, more accurately, she comes with one head and two haircuts. One is long hair, spilling down to the middle of her back, while the other is shorter, reaching just to her jawline. The long hair looks good, but the short... well, let's just say that if your friend got his haircut, you'd have to spend the rest of the day watching movies together and reassuring her that it would grow out soon. It's... it's really bad. Poor girl. Presumably the short hair was included so she can look up (ie, straight ahead) when she's leaning forward on her bike, but it's still a bad choice. Think about it: she's a plain human, not a mystical being like Ghost Rider; give her a normal head, sure, but make the other head a helmet! Imagine a badass black helmet, matching her suit, with a cool red visor over her eyes. 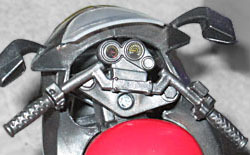 If you really want to be fancy, make the visor a separate articulated piece, so we can see her eyes inside there! Either way, it would be better than the bad haircut. Her articulation is standard: swivel/hinge ankles, double-hinged knees, swivel thighs, balljointed hips, swivel/hinge wrists, swivel/hinge elbows, swivel/hinge shoulders, balljointed torso, hinged neck, and balljointed head. Her hands have the trigger fingers extended, but she has no guns. No accessories at all. Other than her motorcycle, of course! GR's ride was a typical chopper, while Natasha's is a more modern style. 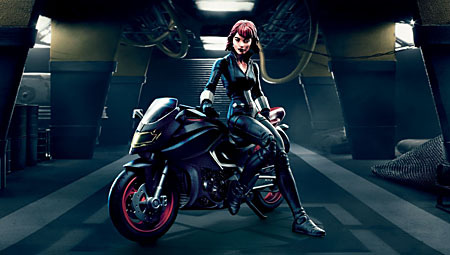 It seems to take some cues from the electric Harley-Davidson Scarlett Johansson rode in Avengers II: The Quickening, while being different enough to not require any licensing payments. The cycle is the kind I, not being well-versed in (or even caring much at all about) vehicle design, associate with Japanese motorcycles: a sweeping angular shape, really low handlebars, all that. Research tells me that makes it a "sport bike." 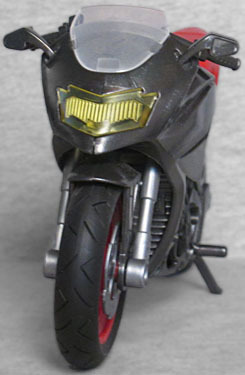 The fairings on the front make it more aerodynamic, and thus faster. 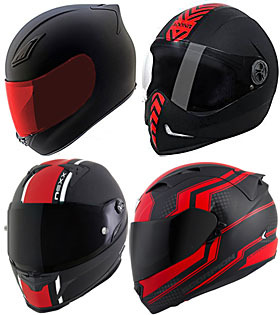 The footpegs are higher than usual, to allow the bike to corner at higher speeds, and the position of the handlebars keeps the rider leaning forward, to keep the profile low - if you go fast enough, the force of the wind will actually support you, keeping you from having to lean all your weight on your hands. Okay, that's pretty cool! Thanks, toy, for teaching me something new! Matching Natasha's colorscheme, the Widowmobile is a dark metallic grey with red on the gas tank, the wheels, and the rear seat. The driver's seat and the engine and both black, matching the wheels. There's a clear windshield, which is really only to help direct airflow, not to protect anyone, and a trans yellow headlight. 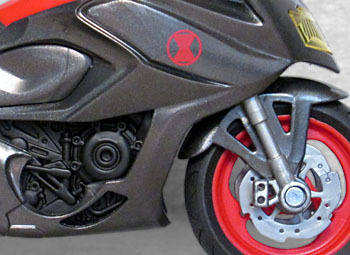 There's no assembly required on this set like there was with Ghost Rider, but the front wheel is still steerable, and the kickstand is more realistic this time. Are there stickers on the dials and gauges? You bet there are! Her RPMs are nearly in the red, but the speedometer shows she's onlygoing about seven miles per hour. Feel free to swing by our message board and give us a reason for why this would be. Meta-contextually, putting Black Widow in this line makes sense: she's insanely popular from the movies, and there was that whole #WheresBlackWidow thing, so this is kind of an apology for that. On her own, though? She's kind of a weak inclusion. The Retro Collection figure hit stores only about a month or so before this one, so there are two Black Widows on shelves concurrently. This one has a new sculpt, but that one has a better belt and some guns. 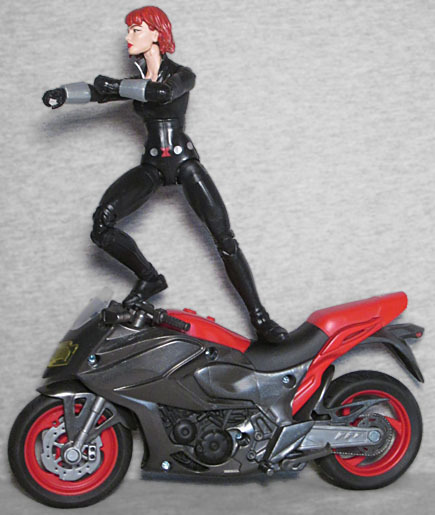 I didn't plan to get Black Widow and her bike, because she isn't really associated with one, but the final product is better than anticipated. 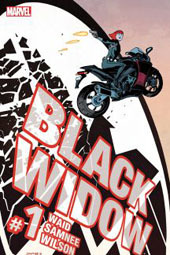 Hopefully this line will continue, so we can get some other major Marvel motorcyclists. Team America for Series 2!